The UK’s most unlikely export? Footpaths and recreational walking! It’s a beautiful if cool start to the day, crisp and clear, with the warmth of the suntussling against a gentle Arctic breeze threatening a frosty edge to the day. Walking through grassy fields, I ponder my good fortune. As I’m here, well really because I want to be. Walking for leisure is a luxury that we almost take for granted in the UK. We are fortunate to have a centuries-old tradition of leisure walking that many countries, particularly in Asia or Africa, do not. Where, outside a sometimes excellent set of long-distance trails or formal leisure areas, heading off into rural farmland is all but impossible without the landowners direct permission. Indeed, it is said that our rights of way are the envy of many parts of the world. I am just above Bradfield, a stone’s throw from Sheffield along the Loxley valley. I’m walking with Chris Prescott, Secretary of the Bradfield group of Walkers are Welcome (WaW), and as he says, “It’s the green lung of Sheffield, giving breathing space to a large urban area”. In conversation, he mentions a recent visit by Japanese academics to walk with another WaW group, down in Winchcombe. They were amazed to discover that our footpaths can go through farmyards, with one of the professors commenting that would never be the case in Japan. As Japanese farmland is privately owned with no right of access. Indeed, until about 20 years ago, there was no tradition of walking for pleasure in Japan. Walking was just purposeful local transport, often to visit a sacred shrine. (Shinto, a uniquely Japanese belief system, holds certain mountains and other natural features of the landscape as sacred). More recently, private individuals or local footpath organisations have begun to develop “courses” – a uniquely Japanese take on the British footpath. These may be based on “rido” (narrow tracks which were historically constructed for local communal use), or they may be developed afresh where no path existed before. Often a printed map of the course acts as your “token” of right to access it. The Footpath Association of Japan (FAJ) is in the process of linking together the community groups who care for these new footpaths throughout Japan. FAJ have turned to the UK’s Walkers are Welcome community-led network of towns and villages “with something special to offer all walkers” for guidance. The WaW network has now reached over 100 member communities and contributed an estimated £4.5million* to the local economy across the UK and FAJ hopes to emulate their success. It all began in Hebden Bridge, just 12 years ago. Andrew Bibby, a long-time resident and keen walker, had seen how walkers who might otherwise be interested in the town were bypassing it on the high moorlands of the Pennine Way, while town centre business premises were closing down through lack of custom. As he explains “The Walkers are Welcome idea benefits towns and villages as well as walkers. It brings money into the local economy. By spending money on simple things like coffee and cakes, parking and bus fares, walkers help to keep our rural communities alive. Currently the network stretches from Liskeard in Cornwall to Unst in The Shetland Isles and St Dogmaels in Pembrokeshire to Cromer in Norfolk. There are even Gaelic and Welsh versions of the golden bootprints WaW logo. As we rise towards the Dukes Road, named after the Duke of Norfolk who was keen on private access for grouse shooting rather than leisure walking for all, Chris reminds me this was the scene of Bradfield’s own Mass Trespass – some five months after Kinder. The Trespasses were driven, at least in part, by mass discontent with Enclosure Acts. These effectively privatised the countryside, excluded local people from many paths, and changed people’s way of life from small scale farming to urban employment. There is a synergy in the idea of footpaths returning a degree of prosperity to rural communities. In Japan, recent significant rural decline is a hot topic, as villages empty when youngsters move to the cities for university education and stay there for work. Their government hopes footpath walking is the answer. 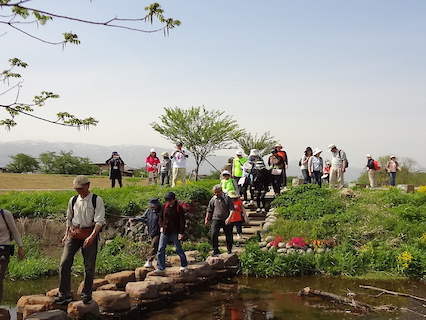 WaW’s association with the developing Japanese footpaths community has led to Chris and two colleagues from WaW’s national committee being invited to a Japanese walking conference. They will visit the length and breadth of the country from Hokkaido in the north to Kumamoto in the far south. While out there Chris hopes to introduce the Japanese to one of England’s lesser known, but highly respected 19th Century Romantic poets, John Clare. Unlike Wordsworth, whose crowd of golden daffodils celebrates freedom of access to the countryside; Clare understood all too well the consequences of the loss of footpaths decimated through Enclosure Acts in his Northamptonshire village and “dreaded walking where there was no path”. In Japan the footpath movement is just beginning – and each walking community will likely do things their own way, just as each WaW community does in the UK. Some WaW communities may put all their effort into maintaining existing footpaths and promoting what they have already; others may develop new routes or hold walking festivals. All, however, tend to be the smaller towns and villages that people haven’t traditionally associated with walking, but believe they have something unique to offer too. But however each community prioritises things, the golden bootprint WaW logo guarantees that walkers are entering a community that has walkers interests at heart – whether in Kagoshima or Kirkby Stephen.